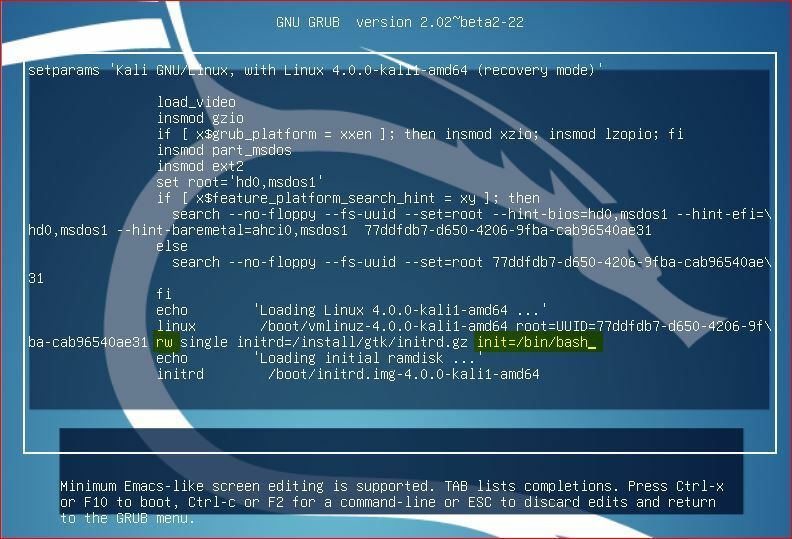 In this tutorial, you will learn how to recover when you forgot Kali Linux password by using Advanced options for Kali GNU/Linux from the GNU GRUB page. It will take only a minute to reset Kali Linux password. Follow these five simple steps to reset the lost password of Kali Linux easily. Step 1: Restart your Kali Linux When the GNU GRUB window appears Choose Advanced options for Kali GNU/Linux. Step 2: Now simply select the second one Recovery mode option and press E key to go to recovery mode of Kali Linux. Step 3: To modify it just change read-only mode (ro) to rw (write mode) and add init=/bin/bash like below screenshot then press F10 to reboot the Kali Linux. Step 4: After rebooting the Kali Linux system, it will bring you the bellow screen to reset Kali Linux password. Step 5: To reset root password of Kali Linux system, simply type “passwd root” and hit the enter. Then type the new password twice for the root user. After successfully resetting Kali Linux lost password, you will see the succeed message*password update successfully*. Well reboot the system normally and log in with a newly changed password of root user. Finally, I hope you can easily and simply reset Kali Linux lost password on your system. If you have any issue, please comment us through the comment section. We are trying to help you more in order to learn Kali Linux or reset root password.